We have been in the full swing of Halloween the past few weeks, last week we headed to the corn maze for Autumns birthday, the kids had a blast and even had fun watching them blow up a pumpkin and search for candy after, this week we decorated pumpkins and Linc and I had a mommy/son date at this school this week, we dressed up, decorated pumpkins in his class and got to watch the school in the costume parade where all the kids walk around the school showing off their costumes, it was super cute and fun! Friday we headed down to ghouls night out at heritage park, I have never been before but it was a blast and for sure think we will make it a tradition with our kids and friends! It was actually really spooky, it was getting really dark and heritage park had actors everywhere dressed up as creepy zombies, they didn't speak and would walk up to you and scare you, Lincoln though he was awesome because he had his iron man shooter on his arm and he pressed it and shot it at the zombie and she pretended like she got blasted from it haha, he was so pleased talking about how he got that zombie and was protecting us! He was brave enough to venture into the haunted house with his daddy and he liked it so much he went back for a second time around! The kids had a blast and we had a super fun weekend having Autumns halloween party at ballet class and our little friend Bentleys first birthday on saturday! Now it is sunday and it is snowing!! It's crazy, I am sure it wont last but after halloween it will sure be putting me into the christmas spirit :). Anyone remember cute Linc as a skunk when he was just a babes? here's a flashback pic and Autumn wearing his costume. 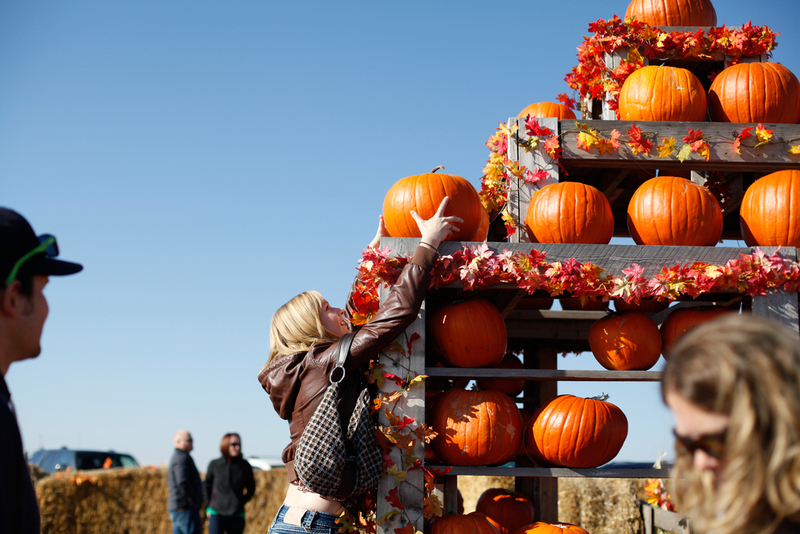 here is Kaylee finding the perfect pumpkin! This carriage was really spooky at heritage park, they were calling out "make way for the dead"
The reed family was the cutest costumes but I forgot to take a pic of them all together, Brian and Christina were bank robbers, Carter was a policeman and bentley was a bag of money, hilarious. these funny stick man people were all over heritage park.